In too much pain to even pick up a ball, Jim Demersseman is back to enjoying competitive tennis. Jim DeMersseman has played competitive tennis since he was 10, and he’s now back playing as captain of his men’s team. Photo by Kati Blocker, UCHealth. 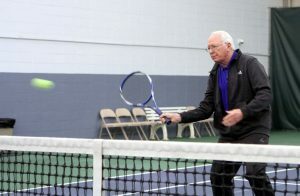 After playing competitive tennis for more than five decades, Jim DeMersseman found himself in too much pain to pick up his tennis ball. He followed up with a massage therapist, physical therapist and chiropractor. Nothing was working; he wasn’t getting better. And the pain grew worse. Having had joint surgery before, DeMersseman decided to return to his orthopedic surgeon at Orthopedic and Spine Center of the Rockies. An X-ray didn’t show any spine issues. So, they decided he’d get an MRI. Three days later, his doctor asked him to come back. Those dots weren’t supposed to be there. Immediately, his surgeon connected him to UCHealth’s Dr. Doug Kemme, a medical oncologist serving northern Colorado. DeMersseman, a high school English teacher at Greeley Central High for almost 30 years, knew of the local cancer doctor. “Kemme is well-known locally,” DeMersseman said. After several more scans and a biopsy of DeMersseman’s lower spine, Kemme confirmed the cause of the pain. White blood cells found in bone marrow help fight infection. One type of cell — plasma cells — make antibodies to help attack and kill germs. In DeMersseman’s case, his plasma cells had started to grow out of control, making abnormal protein and crowding out normal blood-forming cells, such as white and red cells and platelets. The diagnosis was multiple myeloma — a bone cancer. “That’s when I understood that I was a whole lot sicker than I thought I was,” DeMersseman said. The cancer was not only compromising his immune system and lowering his blood count, it was also affecting his bone strength. 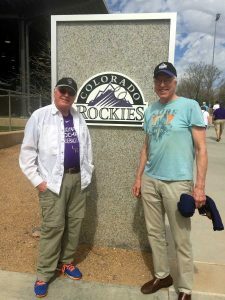 Jim DeMersseman enjoys a recent trip to Phoenix with his brother for spring training. Photo courtesy of Jim DeMersseman. The good news is that a lot of treatment options have been developed over the past decade for myeloma, Kemme said. And being a part of UCHealth, Kemme could also provide DeMersseman access to clinical trials, the latest drug-treatment options and an expert who’s spent his career studying and treating this specific type of cancer, all while getting that care in his northern Colorado community. Myeloma is fairly rare. Kemme only sees a few new patients a year for myeloma, so he reaches out to subspecialized oncologists at UCHealth University of Colorado Hospital and the University of Colorado School of Medicine, and Dr. Peter Forsberg. Before reaching out to Forsberg, Kemme had started Mersseman on radiation therapy to the most painful areas and on three non-chemotherapy drugs, including the pill Revlimid. DeMersseman had a good response, but after a few months he developed a skin rash. “Everyone reacts differently to treatment and that is why a tailored approach with the very best doctors is essential”, Kemme said. The combination of the rash, and the fact that Revlimid’s effectiveness at battling the cancer seemed to have plateaued, had Kemme seeking alternatives. “I have a good idea of our options but there might be a new drug or new research that has just come out, so that’s when I reach out to Dr. Forsberg,” Kemme said. DeMersseman stopped taking Reylimid and started taking Darzalex, a monoclonal antibody. “That caused a good response, and his tumor markers dropped quite dramatically,” Kemme said. He continued with weekly treatments, and his body responded well. And because things were looking good, he began having treatments every other week. 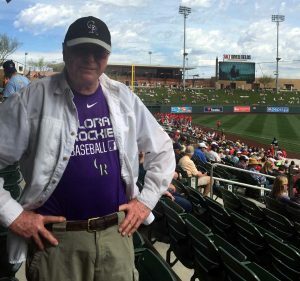 He was doing so well, in fact, that a week before his 76th birthday — now a celebration that also marks another year of surviving cancer, he said — he was in Phoenix with his younger brother for Colorado Rockies spring training. He credits his well-being not only to his treatment but also to his rehab program. DeMersseman is able to get his treatment locally at the UCHealth Cancer Care and Hematology Clinic in Greeley. UCHealth refers its Greeley-area cancer patients for physical therapy to the University of Northern Colorado Cancer Rehabilitation Institute, with which it has a great working relationship, Kemme said. DeMersseman said that his therapist, who’s also a competitive softball player, has tailored DeMersseman’s therapy so he can fulfill his desire to again play competitive tennis. DeMersseman will never be cured of his cancer but through treatment and rehabilitation, he can manage it with a decent quality of life, Kemme said. 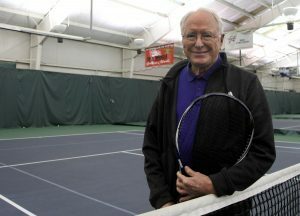 Jim DeMersseman worked back to competitive tennis slowly after being diagnosed with multiple myeloma. He credits his return to competitive tennis to his treatment and rehabilitation regimens. Photo by Kati Blocker, UCHealth. He will continue to receive treatment every other week as well as have blood draws on that same schedule to make sure his drug regimen is still working. But in between, he’s back on the court — a lot. “I’m playing good enough tennis that I can play with my team,” he said proudly. In addition to twice-weekly set court times, he is the captain of a men’s tennis team that starts league play in May. He conducts practices once a week. Kati Blocker is a writer for UCHealth who is based in Fort Collins.